Ford, Lincoln, Mazda, and Honda checklists are now available in digital form for Certified Pre-owned inspections. NEWPORT BEACH, Calif., March 21, 2018 /PRNewswire/ -- AutoMobile Technologies, Inc. (AMT) announces it has added multiple OEM Certified Pre-Owned Inspection Checklists to their online forms library. CPO forms for Ford, Lincoln, Mazda, and Honda are available to users of InspectionNotes™, a mobile inspection app developed for inspections and vehicle condition reports to be performed on a tablet or smartphone. Inspectors perform a multi-point inspection, record answers to questions on a mobile device, and transmit responses to a cloud-based dashboard or via API to websites and third-party software systems. An Inspector can add pictures, video, and digital signatures as part of the inspection process, and print inspection forms on-the-spot or emailed as PDF's. Additionally, users can configure responses within the form to trigger additional steps as needed. InspectionNotes contains common OEM inspection forms plus a custom online forms builder for users to identically match any paper inspection forms they are using. InspectionNotes also enforces a consistent process to ensure all information is collected accurately every time and maintained in history. 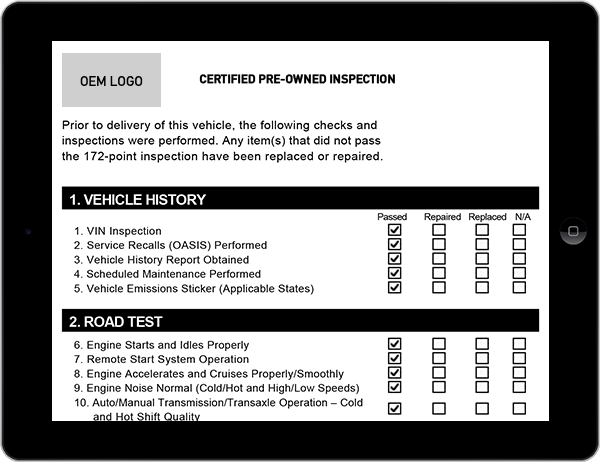 Digital rendering of OEM Certified Pre-owned inspection checklist available in ReconMonitor and InspectionNotes from AutoMobile Technologies, Inc. The InspectionNotes functionality is integrated into AMT's ReconMonitor™ software. ReconMonitor is a full supply chain management solution for Dealerships, Fleet, Rental Car, and Auto Remarketing companies that provides visibility and control across the entire reconditioning process. "Our goal is to offer user-friendly mobile apps, combined with the most advanced cloud software technology, to meet the demands of the automotive industry," says Mike Fischer, Vice President, Sales. "A huge goal for automotive dealerships is to offer excellent value with Certified Pre-Owned vehicles. InspectionNotes hits the mark with its easy to use comprehensive solution by offering an efficient way to provide transparency and accuracy in the CPO process. ReconMonitor integrates the InspectionNotes data into full-cycle vehicle reconditioning workflow management." Additional OEM Certified Pre-owned checklists will be added in the coming months to build and maintain a full complement of CPO inspection capabilities for AMT customers. Logo for AutoMobile Technologies, Inc.